How many times have you been stuck at the airport, waiting for your flight and just sitting there being bored? Whether it’s down to bad weather or for some other mean, completely unfair twist of fate you’re made to wait for hours. I know how painful that can be and now, I have come up with ideas to make time fly. Login in to Twitter and use a hashtag to search for other people who might be stuck at the same airport as you. You’d be refreshing your Twitter all the time anyway, so why not make a good use of it. Use a delay as an excuse to start a conversation with a person you’d like to talk to. You never know, something good might come out of it. If nothing else, at least you can have a good whinge, we all love that! Challenge a stranger to some silly game, such as Arm Wrestling or Rock, Paper, Scissors. There are plenty games you could try, all you need to do is be brave enough to ask a complete stranger to try it with you. Do a performance act for other passenger, someone might even come and start chatting to you. If you do something hilarious, chances are people would approach you more. Something like a failed magic trick, or a funny dance would certainly make everyone laugh. Organise a singing competition with others around you. While it may make your ears bleed when hearing all those “talents”, it’ll kill some time and you’ll be that cool person everyone points at. Are you daring enough to try one of the above suggestions, or are you more for a relaxing things to do? If you are you’re on a business trip, those precious hours could be all you’ll have for a private life until you’re back from your trip. Aside from rare sleep, of course! Read a book. It might seem an obvious and dull choice, but it does make time fly. People watching is one of my favourite pass time. Look at the people at your terminal, who are they and where are they going. You could write a short novel on each person that passes by. Clear up your inbox. Remember all those messages that have been piling up for months, and you had no time to read them? Now you don’t have an excuse, just open your account and go through all of them. There might be something funny inside, people do like to email jokes, or if it’s boring it will help you fall asleep. Go on a shopping spree. It’s much easier to go and buy presents when you’re on your way out. You won’t forget a nice little thing for your partner, and won’t have to worry about it on your way back home. Or how about just sitting there and waiting? You could be tired. Use this opportunity to simply rest. Falling asleep could be an option too, I do it most of the time. Just be careful not to miss your flight! All bicycle enthusiasts have that everlasting dilemma of bringing a bike on the airplane trip. While it is nice to explore the other end of the world by the manual two-wheeler, it is in the same amount stressful to pack and transport your bike via airplane. Getting a professional one, like the ones that are offered at www.wheelbase.co.uk, gives a decent blow to your budget, but transporting it via airplane can cost you even more. Also, some airlines do not charge you this type of transportation if you buy the first-class ticket, so make sure you check that. Here are the basic things you need to know when you plan to fly with your bike. You can buy cardboard or a custom case for your bike. The first one is much cheaper, of course, but in any case, you will need to dismount handlebars and pedals due to airline policies. The cardboard is cheap and easy to edit, which makes the whole packing process easier. Like the majority of professional ones, it weights around 20 pounds, you can add more things in your package like helmet, tools and shoes to fill in the remaining 30 pounds, as the airlines give you 50 pounds of luggage transport free of charge. Do remember though that airlines will not provide an insurance for your bike if it is packed in the cardboard. Therefore, the best thing is to order a custom case and fly with it without any fear. The custom boxes are great but they are not cheap, they will cost you roughly $300. These cases utilize special design to store safely various parts of bike. It provides extra safety for it, but all the airlines requires you to disassembly the whole bike for the security reasons. The best part about the case is that is fits are regular luggage so you don’t need to perform different kinds of check-ups. You can buy custom cases at the bike shops to make your transportation much easier. The majority of travelers will go for a custom case, as it is easier and more profitable in the end. The most of airlines offer you four-hour complaint time, so make sure you double check your bike once you land safely. It is not likely that it will be damaged during transportation, but rather make sure you check everything up. In case you see damage, you can ask for damage claim. Once the company establishes the damage and assesses the price to pay, they will pay you for the damage inflicted during the transportation. Many damages occur when a passenger does not pack properly. 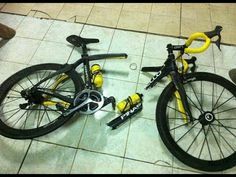 To avoid such problems, you can always go to the specialized shop and ask them to pack it up for you. For a bargain price, they will pack your cycle device properly so it does not damage during the flying. The post Two Crucial Things To Know When Packing A Bike On An Airplane appeared first on UK Airport Guide.